Linked murders 400 years apart create the suspense and intrigue in this literate novel of family secrets, loyalty, and betrayal. Adam Strickland goes to Tuscany to write about a famous memorial garden, but the garden hides secrets – was Flora Docci actually murdered and why? As Adam delves into the mysteries of the garden he is also drawn into a more recent wartime murder involving the son of the matriarch of the villa, putting his own life in danger. 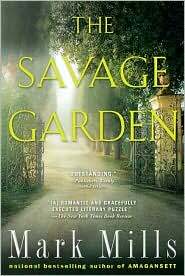 If you liked The DaVinci Code with it’s mysteries wrapped in ancient texts, or are intrigued by twists and turns of wartime loyalties, you’ll love The Savage Garden.